Do you ever get so far behind with blogging that you want to just forget you even have a blog, and pretend like nothing ever happened? You can't be behind on a blog you don't even have, right? I mean, I only document via Instagram, everyone knows that right? If I go long enough, people will forget I had a blog, right? Right? Right? LOL. Ugh! I really want to be someone who regularly updates their blog, but sometimes I would just rather sew, or knit, or watch Fargo (have your watched it yet, the series is awesome and the first season is filmed all around Calgary!!) or reorganize the pantry, or snuggle the pugs, you know how it is, don't you? Anyway, I'm sorry for the unintended break (I'm also super behind in my blog reading, so if you haven't noticed me in the comments, don't worry, I'm getting there. LOL). We are now back in Calgary, enjoying the snow (and by enjoying I mean staying inside as much as possible but looking at it through the window), our cabin is closed up for the winter and we even had a trip to Iceland in there too. So lots of stuff has happened in the last month, but not a lot of it was sewing related. I have however done a whole ton of Christmas sewing over the last 2 weeks, and I really want to share it with you, but as it's all gifts you'll have to wait until after Christmas day. So in the meantime I'll entertain you with some old photos (we took them back in October, I think) of more jeans and a linden. An outfit that was unapologetically copied from Katie (imitation is the sincerest form of flattery, right?). When she first posted her fall Linden and jeans, I knew I wanted an outfit just like it! So this is yet another Linden sweatshirt; I have a whole closet full of tops made from this pattern. It's so quick and easy and can be made in a variety of knit fabrics. I've even seen a few woven ones pop up on the internets too, but I haven't tried that yet. In the interest of copying Katie and for something a little different, I went with the split hem variation, and I really like it. The fabric I used for this sweatshirt is a french terry that came from Girl Charlee many moons ago (I'm not exactly sure what I bought it for, but it's been in my stash for a while). It's really warm, and soft, but the stripes were terribly off grain, so I did the best I could. It does look slightly off when you look closely. The ribbing came from my local Fabricland. The jeans are another pair of Angel-Ginger Hybrids, exactly like this pair, and this pair. This time they are made from a lovely charcoal "black" Cone Mill's denim. This denim is definitely not a true black, it's more of a grey, especially after a few washes, but I really like the colour. It goes with pretty much everything in my closet, and it's a little more casual than true black which suits me just fine. So even though these and my other Angel-Ginger Hybrids, fit really well, and they are mid-rise just like I intended them to be, I'm finding that they still aren't perfect. I really thought I was happy with a "mid-rise" but I've noticed that during and after sitting the waistband tends to roll. So I'm starting to think that I either need to go back to a "low-rise" or try a full "high-rise" jean. I've only ever made the high-rise version of the Ginger jeans once, and I don't think I gave them a fair chance. At the time, I wasn't really used to a higher rise, and I didn't make the now standard adjustments I usually make to jeans. I'm much more experienced at jeans now. I've also recently purchased Lauren's new Birkin jeans pattern, so I'm excited to try that out too. I'm not 100% convinced that it's going to be perfect on me, but I am excited to try it out (especially after seeing Meg's smokin' pair). I'm also really looking forward to the skinny version Lauren intends to release soon too. So expect to see some more jeans sewing from me in 2016! Woo hoo! I've also forayed into sewing jeans for John as well, so I'll do a post about those one of these days as well. Anyway, I'm glad to be back on the blogging wagon, and I'm hoping you are all doing well too. Are you doing any Christmas sewing? Gifts or maybe fancy Christmas outfits? I wore the same Anna I made last year to John's company shin dig. No one noticed and I got lots of compliments! Lazy seamstress for the win! More Jeans & Other Makes too! Hola peeps! How are you all doing on this fine Friday the 13th? Things were going pretty well for me until I had almost completely finished this blog post and Safari crashed and I lost it all. UGH!! (It actually happened twice, so I switched over to Google Chrome and that seems to be better.) And I don't remember everything that I wrote! I guess it's a sign to start over. Anyway, I'm back with surprise, surprise: another pair of jeans, but not to worry, there are some other new me-mades in this post too. Woo hoo! So this ensemble consists of another pair of Ginger-Angel Hybrid jeans (Angers? Gangels? Ginangels? ), a sleeveless Granville, and a Hemlock Tee. All worn shamelessly with my slippers! What can I say, I love my fuzzy slippers! So let's start with the jeans. I don't really have anything new to say about the pattern, as this pair is pretty much exactly the same as my last pair. What does make this pair special is that they are made from a gorgeous 9oz Cone Mill's Denim from Threadbare Fabrics. There is just nothing like a good quality denim. It's so much nicer to work with, it presses nicely, and the best part, it's recovery is amazing. I can wear these baby's for days and they totally maintain their shape. (And by days I mean, I can comfortably wear them four or five times before I need to wash them, unless I spill something on them, ahem coffee, which is pretty common for me 😝). The 9oz denim might actually be a little light for a regular pair of jeans, but I just couldn't resist the colour. It's a slightly lighter shade than the regular indigo you usually see in denim. It's not showing up very well in these photos, but it really is a bit lighter. While the weight of this denim might be a little lighter than what I'm used to, it makes these jeans extremely comfortable, and stretchy (they almost feel like leggings)! I do miss the (ahem) support that a slightly heavier denim would provide though. Plus because I used a quilting cotton for the pockets, you can sort of see the pocket outline through the denim, but that is mostly my fault as I should have went with some lighter scraps, but who can resist surfin' cats? When I got my hands on this denim, I debated making something else out of it due to it's lighter weight. I thought it might make a lovely Chardon or Brumby skirt, a shirtdress or a jean jacket, or even quilted with flannel for a cool Tamarack jacket, but in the end I decided a pair of jeans would probably get the most wear. I almost tried out this pull on version (which I think would be perfect in this weight), but I was too lazy to try a new pattern this time, and I really wanted to make another pair of Ginger-Angels as I wear my first pair a ton! Anyway, enough about the jeans, let's talk about the tops. The lovely striped number is a Grainline Hemlock. I made a Hemlock months ago, and decided that the boxy, one-size fits all pattern just wasn't for me. It seemed too shapeless and long for me, but then I kept seeing cool ones pop up in my Instagram feed, so I decided to give it another go. I mean, the pattern's free, so why not? This time I decided to forgo colour-blocking, shortened the body by 2.5", and made it out of a stripey fabric. I mean you can't go wrong with stripes, right? I am so happy that I gave it another shot. I have been wearing the two that I made pretty much non-stop. It's amazing how something changes when you get the length right. The other one I made is striped too, but I haven't blogged about it. I think this fabric came from my February Knitfix pack from Girl Charlee. It's a french terry, but it is on the thin side; you can easily see the pockets of my Granville coming right though it, so it might not be the best for layering over tops. All summer, I really wanted to make a pale pink Granville top. I even found the perfect fabric at Blackbird Fabrics (it's a beautiful Italian Linen just like this one), but for some reason, I never got around to making one . So in my recent fit of cutting out 5 Granvilles, I decided to include the pink linen. It's a little seasonally inappropriate, but I figured it would work well under sweaters, and worst case scenario: it just hangs in my closet for a few months and then I know it will get a ton of wear when it warms up in the Spring and Summer. I had planned to use some cute little buttons, but when I spotted these cool marble snaps in my stash, I knew it was meant to be. I know they came from Snap Source because they were still in the package, but I couldn't find them on their website. It still looks a little stiff, as I have't washed it since I made it and I starched it like crazy so it would be easier to work with. Linen always seems to stretch out and go wonky on me, and I found that spray starch really helped. Anyway, I hope that you all are having a lovely night, and please hug your loved ones tight and wish or say a prayer (or whatever you do/believe) for peace and the people in Paris. I don't really "pray" myself, but after crying while watching the news, I am trying hard to hold a space of love instead of fear (which I know is really hard), because a big point of these attacks is to evoke fear. Hey Dudes! How's the weekend going? I think you can tell by this dorky smug pose that I'm pretty happy with this pair of jeans - actually, if I'm completely honest, I am totally in love with this whole outfit, and I don't think I ever need to sew anything ever again because I'm just going to wear this outfit everyday for the rest of my life. Ha!! I kid - well only about that last part, I mean really? Me give up sewing? I don't think so! Anyway, after my success with both the Ginger (which hasn't really been mentioned much during this Quest, but I've sewn it up numerous times, see here, here, here, here, here and here, plus a couple of unblogged pairs - oh my gosh have I really sewn that many?!?!) and Angel patterns I decided it might be fun to mash them up. I really like the back pockets of the Angel jeans so I stuck with those. I also used Lisa's awesome flat-felled seam tutorial and finally got that centre back seam to look like it's actually centred. It's a bit of a nit-picky thing, but it always bothered me. If you just sew the back legs together, serge, then topstitch, then the actual seam is in the centre, but when you sew the topstitching it looks a bit off. Using Lisa's method, it ends up looking perfectly centred. I plan on using it from now on, and I expect the more I practice it, the better I'll get (just like anything right?). While I do appreciate having a good bootcut in my jean arsenal, I am pretty addicted to skinny jeans. Especially in the winter, as they are super easy to tuck into boots, so I decided to go with Ginger for the legs. I used my modified front and back leg pieces (by modified I mean that I increased the rise of view A by 1" and skinnied the legs to match view B) and the back yoke from the Gingers too. I really love the pocket shape from the Angels, so that's what I ended up using for this pair, and by doing that I also had to reshape the coin pocket a little bit - but I just eyeballed that. Then I used the super curvy waistband of the Angels. I really like how it hugs my body and doesn't gape at the back. For this pair, I made it slightly narrower so that I wouldn't need two buttons. I also decided to do something a little different with my topstitching. Somewhere either on the internets or maybe in really life, I saw a pair of jeans with red bar tacks and I loved the contrast, so that's what I decided to try on this pair. Lucky for me, my machine was in really good spirits and it totally cooperated with me. I love how it turned out! I used my favourite Sulky thread again, do I sound like a broken record? I love that stuff! I should also mention that this denim was sent to me free of charge by Caroline from Blackbird fabrics to test out. She had it in her shop, but she didn't have time to sew up a pair of jeans and she really wanted to make sure it was up to snuff. So of course, I happily agreed to try it out; a bit of fabric testing if you will. It has since sold out, but I'll tell you about it anyway. I really like the colour of this denim, but I don't think it's *perfect* for skinny jeans. It's got a nice hand but it felt slightly plastic-y on the wrong side when I was working with it. It does feel comfy to wear though, the right side is quite soft. It's a cotton/spandex/poly blend, and for my preference, I think the poly content is just slightly too high. I think they add poly to denim for it's recovery and I've noticed it in the labels of lots of designer denim lately (I'm always researching! ), but I think the key is finding the right amount. I will admit that the recovery is pretty good though, I can get about 2 days wear out of these before having to throw them in the wash, which is more than I can say for some of the other denims I've tried out. Anyway, I passed on my review to Caroline and she has decided to look for something else, so keep an eye on her shop if you're interested. While we're on the fabric subject, I have to say that I am so delighted to have so many amazing sewing friends with fabric shops that I get to support. It makes me feel so happy to be able to support small, independent businesses, and ecstatic to support ones owned by my friends. I think that between Caroline, Katie, and now Sonja - I'm pretty much set. Hooray for sewing friends! lengthened the back crotch curve by 1"
So there you have it - I think this pair is pretty much close to perfect. There are a couple of tweaks to make, but they are very, very minor. I had a bit of a hard time writing this post, because with this pair, you might think my quest should be over, and I really don't want it to end. I still have a few patterns in my stash I want to try out, in particular: the Jalie Jeans pattern, and the Hot Patterns Boyfriend jean, but I do have a couple others in the stash too (I'm a collector). So I guess I'll leave it to you, dear reader, should the quest stop here? Do you want me to keep going? Is there a particular pattern you'd like me to try, and review for you? Or are you totally sick of reading about jeans? I have acquired quite a large stash of denim, and jeans have become one of my favourite things to sew, so please let me know if you have any requests. Also, I should mention my shirt! This is the first of 5 Granvilles I recently cut out, and I absolutely love it! I worked really hard on the plaid matching across the front (a first for me, as I usually don't), and the fabric I made it out of is so luxurious. It's a japanese cotton shirting I bought from Blackbird a few months ago. It's so soft and the perfect shirt weight. I also used some liberty fabric for the inside yoke and collar stand which coincidentally matches the pockets in these jeans. Sewing outfit win! If you want to know about what fit changes I made to this shirt, see this post. Also, I think this picture pretty much captures the essence that is me. LOL. Hope you are having a lovely weekend! Hello Everybody!! Can you believe it's October 1st already?!? Where has the time gone?! There is definitely a chill in the air, and the leaves are turning to dazzling shades of red and gold, and the air is starting to have that lovely fall smell. I'm trying to soak it all in as much as possible before it's all gone. Fall is just such a beautiful season, but it always ends way too soon. Anyway, if you follow me on Instagram you will notice that I have become an obsessed jeans maker, well and an obsessed shirtmaker too but I'll blog about that later (my blog is a little behind my Instagram feed). For now, let's concentrate on the Quest for Perfect Jeans! The only jeans pattern that I have successfully made, up until this point, is the Closet Case Files Ginger Jeans. It's a really great pattern and I have made both versions of it multiple times, but I thought it might be fun to try out some other ones too. So enter the Angela Wolf Angel Bootcut Jeans pattern. A few months ago, during a Craftsy sale, I bought the Designer Jean class taught by Angela Wolf. It looked like a good class, and I figured I would pick up a few tips as I always seem to do from Craftsy classes (no affiliate links here peeps, no one wants to be affiliated with me. LOL). I was actually in Maui at the time and jonesing for some sewing, plus I'm kind of a sponge for sewing info so it seemed like a good idea. Anyway, Angela's jeans are a bit too blingy for me, but I really liked her class, and she seemed super sweet, not to mention incredibly knowledgable, so I decided to pick up her pattern anyway. I have yet to try any of the distressing techniques, but I really want to one of these days. I made a ton of changes to this pattern right off the bat because I didn't want to make a bootcut jean, but then I got to wondering if maybe I should have made a pair as the pattern is designed, so that I can give a proper review. So I did end up making a second pair and I'll blog about those next. Anyway, to slim the legs down, I used a pair of RTW trousers from my cupboard and used this tutorial to copy the measurements to the pattern. I chose my size based on my hip size and I think they might actually be too big to begin with, but after wearing them for an hour or so, they totally stretch out and start to look about 3 sizes to big, like falling down too big. I wish I could tell you about the denim I used, but I really have no memory of where it's from. It was in my stash and I don't remember it at all. I'm thinking it's probably some left over Girl Charlee Denim, but who knows (you know your stash is too big when...). Anyway, I wouldn't really recommend it even if I could remember where it came from. The colour is really nice and it feels nice to wear, but it bags out way too fast. Oh well, I know I'll still wear these, and they'll be a pair that goes in the dryer - so maybe they'll shrink and fit perfectly someday. LOL. (I should also mention that I know about a new denim source opening very soon, and I'm super, over the moon excited to share it with you, but alas it's not open yet, so more on that later.) For the topstitching I used my favourite Sulky thread. It just works so well with my machine and it comes in so many great colours, even variegated. had a bit of difficulty with the front fly construction, but I worked it out - I think I cut a little too much off the right side. Oops! shortened the legs at the lengthen/shorten line by 5 inches!! So I made some mistakes, and I'm not sure this is the best representation of this pattern (or my jeans making for that matter). But the pattern is really well drafted and the instructions are great. The pattern comes with a little coil bound book with lots of tips mingled in with the instructions. I'll take a photo of it for my next post so you can all see. If you've never made any trousers, or jeans before, I probably wouldn't recommend this pattern for your first go as the fly construction is a bit tricky, but that might just me. This pattern is designed to have a wide waistband, which feels a bit weird at first, but once I got used to it, I actually really like it. It's comfortable, and something a little different. PS: What do you think of my Archer pop-over? I made it back in May and haven't worn it a ton because it was just too warm this summer. It's in rotation now though. I'm not sure the fabric combo was the best - I love how it looks but the denim is just so stiff against the floaty rayon that it's a bit weird to wear. It might deserve it's own blog post, but that just didn't happen. Topstitching Thread - try different weights and colours, and don't be afraid to try different brands. I love the Gutterman denim topstitching thread that you can find at JoAnn's or Fabricland, but there aren't a ton of colours available. I ended up chatting with the lady who sold me my Pfaff about it, and she suggested a heavyweight cotton quilting thread (Sulky 12wt.). It comes it tons of different colours and my machine loves it. It sews really well and I don't struggle to make bar tacks or button holes with it, plus it comes in variegated rainbow so you gotta love that! I have also tried the Coats & Clark denim thread and had lots of luck with it too. 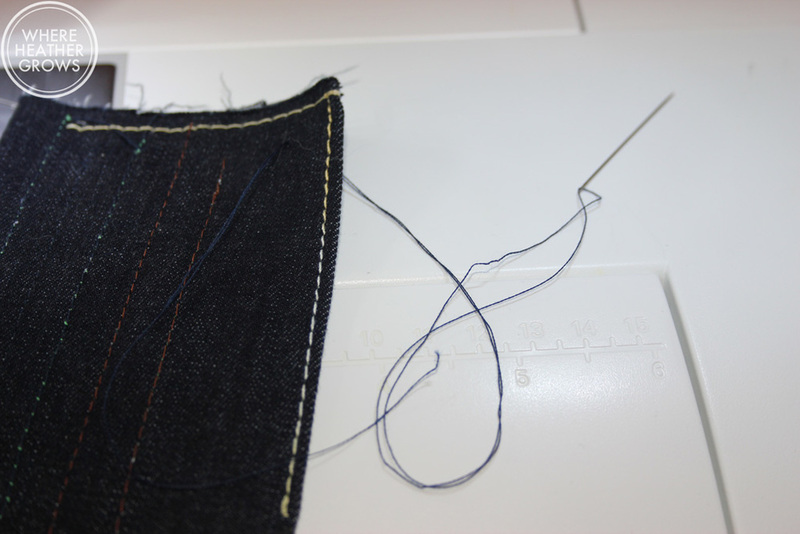 I should also mention that I use navy thread in my bobbin, or sometimes I use the Gutterman denim thread that is a little bit lighter weight than the topstitching thread and it works really well too. Also, bear in mind that you may have to play with your machine's tension, so it's a good idea to have your machine's manual handy and try some test stitches before you start. 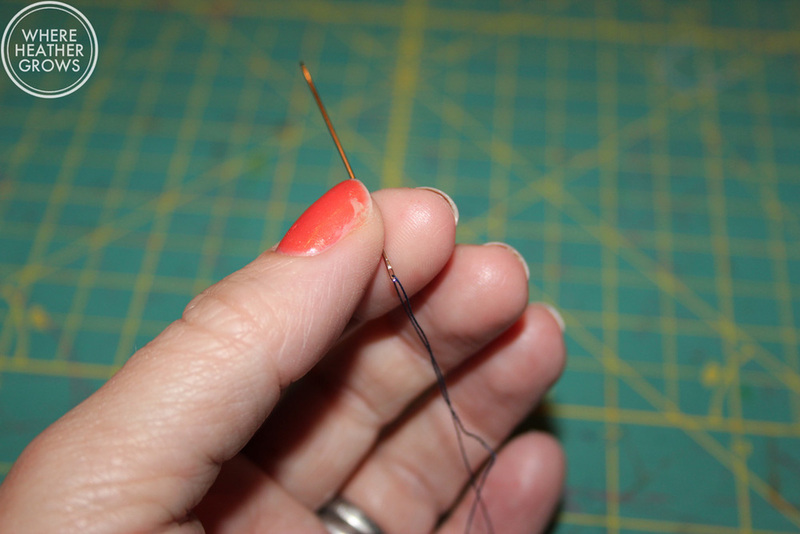 Needles - I have found that a dedicated topstitching needle works the best. And I try to use a new one for each pair of jeans I make. I have tried sewing jeans with a denim needle, and a larger universal needle, but neither seem to work as well as a proper topstitching needle. So if you are finding that you are having troubles, changing your needle is an easy thing to try. For beautiful looking topstitching, lengthen your stitch - at first I really didn't want to do that. I don't know why, but I just thought a 3.5-4mm stitch looked way too long. But after making a of couple pairs now, I know it's not. It might look weird at first when you are sewing, but once you have your jeans constructed, and you put those bad boys on, a longer stitch length looks better. Check out a pair of RTW jeans, and compare. Once you have your machine set to where you want it for topstitching and your stitches look the way you want them too, take a quick cellphone pic of your settings. It's an easy and quick way to refer back to your settings. When you are going back and forth with changing thread, or maybe you are sewing over a few days or weeks, you know exactly where everything was set. Maybe it's just me, but I've forgotten exactly what length I've set my machine to, and then I've had to waste time figuring it out. It's also nice to do for your bar tack stitch setting too. Slow down - This is something I am constantly working on with pretty much everything I sew. Sometimes I just get into "must finish this right now" mode, and I put the pedal to the metal, and zoom away. With topstitching, you really need to take your time to be accurate and straight. My sewing machine has an option to slow the speed down, so when I'm making jeans, I always turn the speed down. 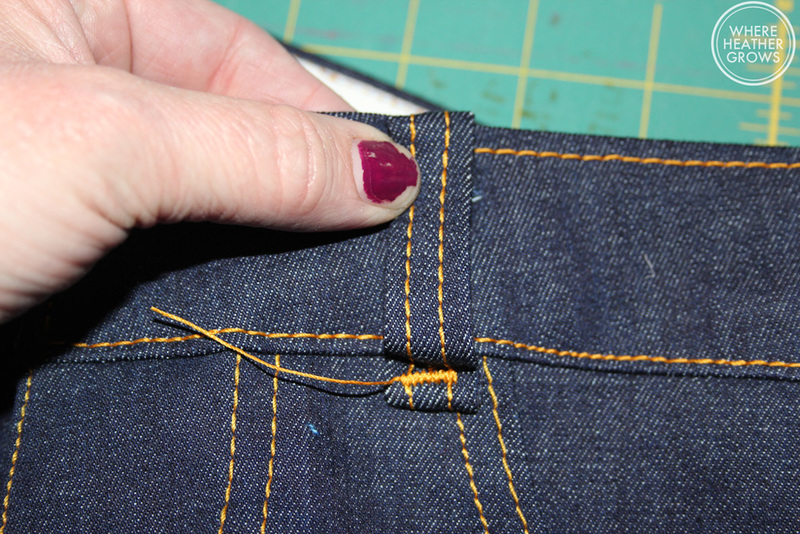 I think one of the trickiest parts of sewing jeans, is topstitching the fly front. I have found that if I mark my lines with chalk (or whatever removable marking tool you would normally use), and then start from the centre front at the bottom, things go more smoothly for me. I don't know if it's because I get the curve out of the way, right away, or if it allows me to see better. But starting from the bottom seems to garner the best result for me. Don't be afraid to play around with the direction of things and find what works best for you. Oh and really try to make sure you catch that fly facing underneath too, that helps things to stay in place better when you wear the jeans. Bar Tacks - I am lucky enough to have a machine that actually has a bar tack stitch (although it doesn't always work as smoothly as I would like), but if you don't, a tight zig zag stitch is usually what's recommended. Recently I have discovered that a really narrow satin stitch works really well too. I really like how it looks and it's really strong. I used it for all the bar tacks on my last pair of jeans, and it worked really well. Interfacing - do you really need it? There is a bit of a debate about whether or not you really need interfacing for denim. I have tried it both ways, and my finding: use it! I like to use a lightweight interfacing so things don't get too bulky, but you should probably judge it by the weight of your denim. For my Cone Mills denim pair I used a really lightweight interfacing, but for my Girl Charlee denim pair, I used a medium weight interfacing. It helps everything maintain structure and it keeps your waistband from stretching out too much. I always sew my back legs together, do the middle lines of topstitching and then attach my pockets. This allows me to use the topstitching lines to place my pockets evenly and then things look a bit more centred. If you attach your pockets first, I find one always looks slightly off, or too close to the centre. I also use my tailor's ham to pin the pockets in place before I stitch them on. I find that because they will be against a curve when you wear the jeans, positioning them on a curve before you sew them helps them to lay better when the jeans are finished. So you sew them to the pants, then you attach the waistband, and finish off the belt loops. If you find that your belt loops are too long, you can always trim them off at this point. Does that make sense? You are just using that thread to pull or guide the fabric so it doesn't get eaten by your machine. So there you have it, my tips for sewing jeans. I hope you take away at least one thing that might be helpful to you. I really want my blog to be helpful, as well as a place for me to share my projects and communicate with all of you lovelies. Anyway, if I come up with anything else that might be helpful when I make my next pair, I will be sure to let you know. I hope your week is going well, and that you having lots of fun with the final days of Me Made May! Have you made jeans yet? Do you have any tips to share? I would love to hear/read them if you do!